There was a time, back in the last century, when I would finish my frames using a blowtorch instead of applying more traditional wood finishes. Last year I decided to revisit that approach on a new set of artworks, some of which are pictured here. I figured it had been long enough that nobody would remember the first time I did this so I could do it again and maybe folks would think I just came up with a whole new idea. If not, if someone says, “Hey, I recently saw some artist on Facebook doing that and you probably just stole the idea,” then I can still dig out my old slides and say, “Not so fast pardner. Check this out. I was doing that whole burned wood thing back in 1989!” But I really don’t want to have to try to find those old slides, so let’s just take my word for it, okay? This artwork is called “Dusty Framed.” It’s roughly 2’x2.5′. Dusty was a most excellent rooster of ours with an interesting name. He passed not so long ago. Why was he called “Dusty” you might ask. Or not. I’ll tell you anyway. First, some chicken and egg basics. Americauna (a breed) hens lay blue eggs. Copper Maran (another breed) hens lay dark brown eggs. If you cross an Americauna hen with a Copper Maran rooster you get a hen that lays a green egg. These hens are often referred to as Olive Eggers. For many years we had a magnificent rooster (yes, all roosters are magnificent) named Wooster that administered to and protected our flock of hens, many of which were Americaunas. But Wooster got quite aged, lost use of one of his legs and seemed to be losing his sight. We decided we needed a new, healthy rooster if we were going to keep the hens safe from hawks, owls, and other predators. Backing up a second. This young couple had purchased Dusty the rooster specifically for mating with their flock of Americauna hens in hopes of producing a flock of Olive Eggers. Having now hatched a bunch of new chicks, they decided they no longer had need of Dusty which is why he was for sale. So that’s how Dusty got his name. And I bet you weren’t prepared for how quickly that story got bawdy. Oh. Say can you see? A while back, maybe 6-7 years, I got the thought in my head that the leaves from sweet gum trees resembled five-pointed stars of the kind that appear on the American flag. Might have been brilliant insight, or maybe just the bourbon talking. We’ll never know. 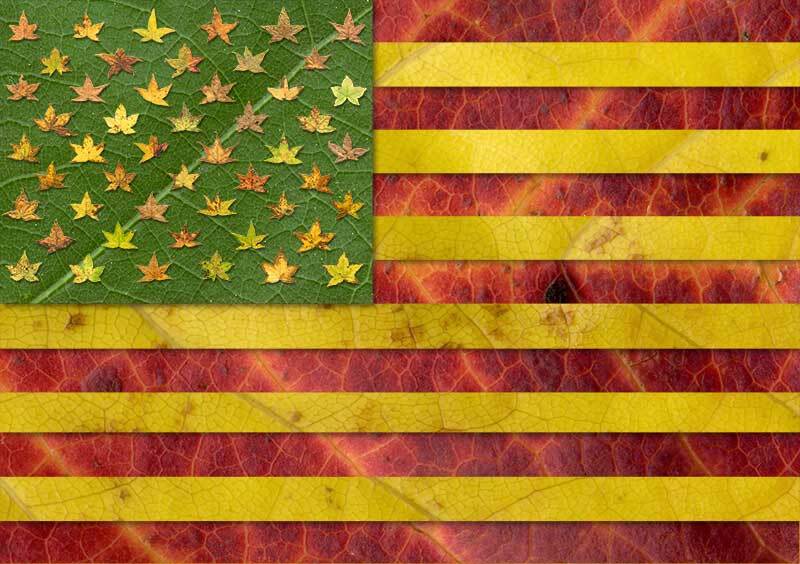 So anyway, I collected 50 sweet gum leaves, plus a red maple leaf, a yellow poplar leaf and a green sycamore leaf and using my scanner and Photoshop assembled this image that I called the “Leaf Flag.” It’s sort of an outlier to most of my work. I keep thinking about printing it large and hanging it outdoors but so far I’ve just made it available as an inkjet print in a bin in my yurt gallery/studio. Turned out the young woman was a foreign exchange student going to college in North Carolina and using her free time to see as much of the USA as she could. She was from Zimbabwe and majoring in business and politics. She spent a good deal of time on the poetry walk and eventually arrived at the yurt gallery where I met up with her again. We chatted a bit. She impressed me as being both curious and insightful and I quite enjoyed our conversation. After perusing the gallery she was preparing to leave when she stopped by the bin of inkjet prints and started leafing through them. She found a leaf image she liked and set it aside, and kept on. Then she came to the “Leaf Flag” image. Instead of laughing and going on the next image like most visitors, she asked if she could take that print too. I said sure, even though I couldn’t fathom the appeal of an American flag image to a visitor from Zimbabwe. Then she explained. The colors of your flag image are the same colors as those of my flag. I can take this print back and put it on my wall and it will represent both where I am and where I’m from. 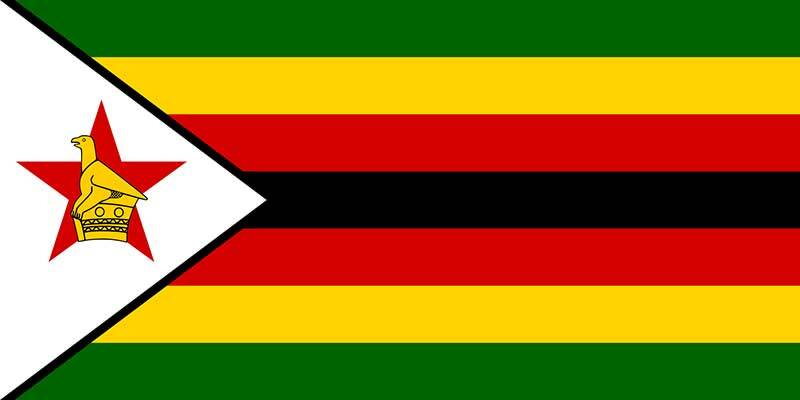 So today I had to go find a picture of the Zimbabwe flag. Here it is. That’s all I got. Now I’m wondering what inspirations are at work when countries choose colors for their flags. Do some look inward for emotional colors, and others look outward for nature’s colors? Somebody must have researched this. Anyway, what an interesting coincidence. Current open houses for Bourbon, Dogs and Art and Woodland Banners Poetry Walk are October 29-30 and November 5-6, from 1 to 5. Or you can always contact us for an appointment. Click here for contact info, location and more.